What happens when film leaves the theatre and enters the exhibition space? The linear sequence of images break away from the conventional cinema screen. We leave our movie seats and wander through a room where film and architecture merge. The poetic synchronism of audio-visual collages – projected onto areas of interior surfaces – is equally a performative act expanding upon the media and a monumental spatial sculpture. In this shifting and overlapping of space and time, the images come together indelibly and the aura of the original work remains vivid. Story turns to image and image turns to texture: manifestations of memories are given new life in the present within the exhibition space. Spatial borders disappear and are translated into new narrative spaces. 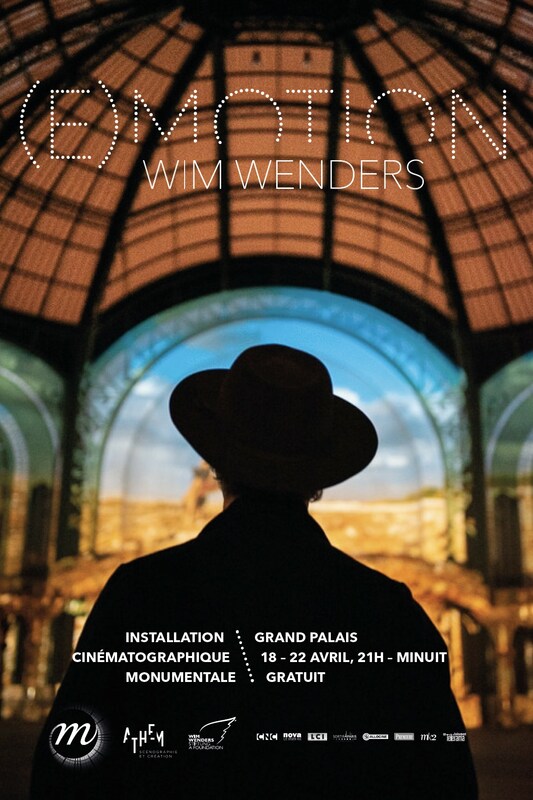 Free admission, Wim Wenders will be in attendance on April 18th. At this event we shift the viewers’ attention from a new perspective to the artistic universe of Wim Wenders and look forward to the foundation’s next step of bringing his complete oeuvre to the public. I am happy to be back from parental leave since February 1st and thank our team, partners and collaborators for their active support and committed work. The exhibition Wim Wenders Early Photographs 1960s-1980s is on view at the METRO Kinokulturhaus in Vienna until June 9th. Filmarchiv Austria at METRO Kinokulturhaus, Johannesgasse 4, 1010 Vienna. Opening hours: daily 3 to 9 pm. Eye Filmmuseum and the University of Amsterdam invite Laura Holtorf & Francesca Hecht to lecture and give a workshop about the restoration of “Wings of Desire” as part of their course This is Film! Film Heritage in Practice. Eye Filmmuseum, IJpromenade 1, 1031 KT Amsterdam, 8th of May, 3:30 pm screening of the 4K restored version. The China Film Archive together with the Goethe-Institut China will dedicate an extensive retrospective of about 20 films to the work of Wim Wenders. The program includes a masterclass and several Q&As. From the 17th of May to the 30th of June in Beijing.